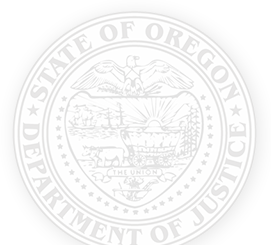 The Oregon Department of Justice (DOJ) billing system details the cost of state legal services. Invoices are sent monthly. They include a description of the work, the time spent on that work and the rate being charged. Invoices reflect the professional staff hours worked at the applicable billing rates, plus any direct costs related to specific matters. Rates are based on actual costs of personnel, services and supplies, and overhead. Examples include clerical support, coordination, and necessary support systems such as computers and law libraries. *In limited circumstances, we provide clerical assistance and bill the agency at the rate of $49 per hour. Expenses, identified as costs not covered by the rate, are billed only if they are incurred directly as part of the legal work necessary. Recoverable expenses billed to an agency and later cancelled will appear on the agency’s invoice as a credit for that matter’s expense. Westlaw is a research service. Charges for its use usually appear on billings a month or two after the legal staff time has been billed. The invoice lists individual entries in order of matter number. The miscellaneous (general advice) matter normally prints first. The remaining matters follow in alphanumeric order. On the left hand side is the matter name. On the right, is the matter number. The next line shows your contact, if one is listed in our billing system. At the end of each invoice, a summary lists the employee(s), total hours and applicable rates. A summary of matters billed on the invoice follows the expenses. If you have a question about the amount of time or expenses billed, and it is not an accounting question, DOJ will direct the question to the attorney or other professional staff responsible for the charge.